Solid Edge ST10 Basics and Beyond provides the student or practicing engineer with a basic introduction to 3D modeling using Solid Edge ST10. The topics are laid out in step-by-step format with examples and exercises at the end of each chapter to practice the concepts covered. The author uses numerous computer screenshots to explain the software features. Solid Edge is different from the other Computer Aided Designing software’s. It offers a rich set of tools known as Synchronous Modeling tools, which help you to create and edit design concepts very quickly and easily. Also, it helps you to design models keeping in mind the final design intent. However, you are required to know rules of this software to avoid any errors. 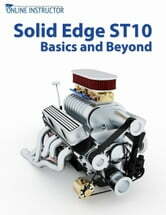 This book will be helpful, if you are beginning to learn Solid Edge.